Simply Deeptima | Beauty and Lifestyle Blog: Illamasqua Human Fundamentalism Collection. HUMAN FUNDAMENTALISM IS AN EXPLOSION OF YOUR ALTER EGO. IT'S BECOMING WHO YOU ARE NOT WHO YOU'RE TOLD TO BE. BEAUTY ISN'T CONFORMITY, BUT THE FUNDAMENTAL HUMAN DESIRE TO EXPRESS YOUR INNER SELF ON THE OUTSIDE. "HUMAN FUNDAMENTALISM IS THE UNIQUE SPIRIT AND FUNDAMENTAL HUMAN DERIVE AND INDIVIDUALITY. IT'S BELIEF , A MOVEMENT AND AN EMOTION. A CONNECTION WITH THE SPRITE OF THE AGE AND ITS GLOBAL MOTIFS. YOU ARE YOUR OWN HUMAN HYBRID, A UNIQUE WOMAN OF STREET CULTURE AND GLOBAL TRENDS." ALTER BOX, ILLAMASQUA CREATIVE DIRECTOR. 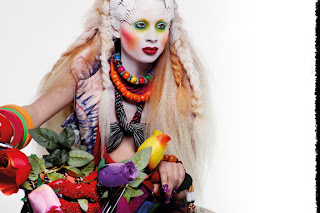 Illamasqua is reborn with its new collection "THE HUMAN FUNDAMENTALISM". Step out of your comfort zone be bold and creative with the bold and bright colours from this range. Be different , be unique and stand out from the crowd because it's no fun bring a plain jane. Take a glance at the products. oh i even got a lollipop candy..
Pre-order from 7th March 2012, Available from 15th March 2012 across online and our Illamasqua stores and counters. Product send by brand/PR for consideration. Sealing gel is an amazing product ! !